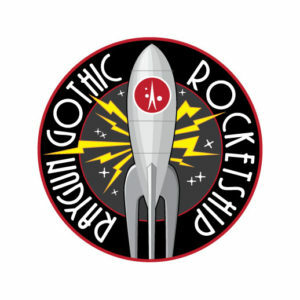 The RAYGUN GOTHIC ROCKETSHIP is an immersive rocketship base environment consisting of a tall metal rocket connected via walkway to a taller gantry with a well-defined lighted perimeter. 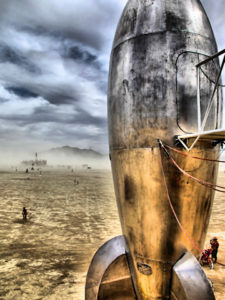 Participants can interactively explore the rocketship’s three interior chambers accessible through the bottom of the rocket and the top of the rocket via the gantry. Aesthetically the project will be done in a rococo retro-futurist future-rustic vernacular between yesterday’s tomorrow and the future that never was, a critical kitsch somewhere between The Moons of Mongo & Manga Nouveau. Imagine Fritz Lang’s 1927 film “Metropolis,” Jules Verne’s 1865 novel “From The Earth to the Moon”, Edgar Rice Bourroughs’ 1912 Barsoom baroque, and Joss Wheedon’s television series “Firefly.” Now imagine Flash Gordon and Buck Rodgers at 50 years of age. They’re heroes, their glory days are behind them and they’ve not necessarily aged all that gracefully. Clean living and caution haven’t been their watchwords. Amongst the polished rivets, graceful deco fins and serpentine lines, there’s grit, dirt, grain and hard living. The moon’s yellow gleam travels brightly along the elongated teardrop fuselage as you near the Rocket. The eye is drawn to the portholes winking with light and then to the illuminated Gantry platform blinking adjacent to the Rocket, to the slip of steam curling around the gigantic fins. As you move closer you realize the size and scale of it are simply huge. A barely subterranean light, ruby-red, then softly pulsing orange suffuses the air above the ground and you look down to see a glowing segment of a vast circle of light, the Rocket Base’s perimeter ring. Pausing at the blast ring you notice the Rocketships’s fluid lines are a little jagged and have seen more than a few repairs. The riveted skin, though clearly well maintained is pitted in spots, its patina scoured with use. The three fins are 16’ tall and they are magnificent, every intricate detail of the scroll work, every strange world, space battle, sucker mark, and alien encounter is there. 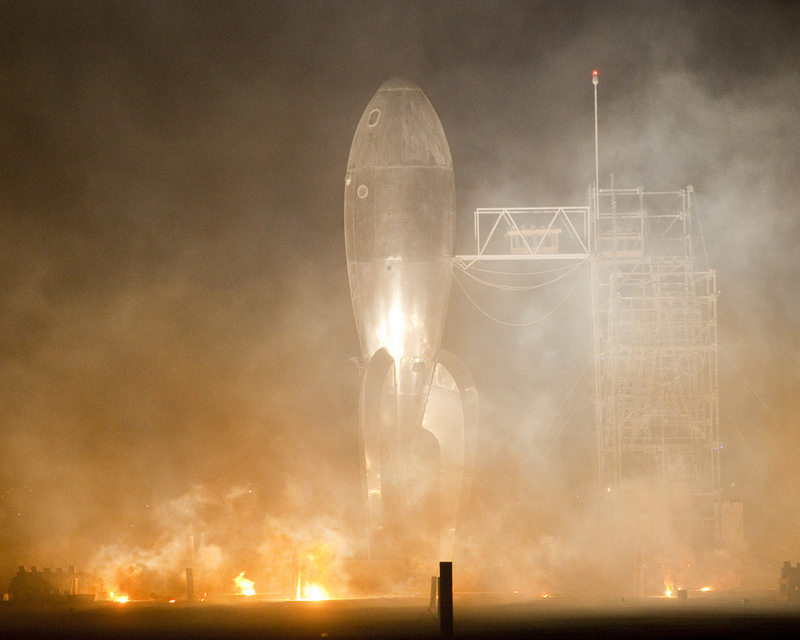 You enter the Rocketship via a ladder and find yourself in the ENGINE ROOM. A tactile, subsonic purr embraces you. The Oscillation Overthruster seems strangely familiar, as does the rack of rayguns. You resist the urge to press the shiny red “Self-Destruct” button and climb up the ladder into the BIO LAB & OBSERVATORY. The dioramas contain strange creatures and alien specimens, some are carbon based, some silicon based and you can interact with them all. The meaningful groping of a furry tentacle and an insistent pinging noise motivate you to continue up another ladder into the CONTROL ROOM. The mind delights as it boggles with the profusion of viewing screens, control panels, cranks, gears, dials, steering wheels, levers, the mighty Space-O-Phone, Atomic Toaster, etc. The cool night air pours through the hatchway, drawing you out onto the walkway that connects the Rocketship to the Gantry, you’ve gained a stellar vantage point over the entire city. 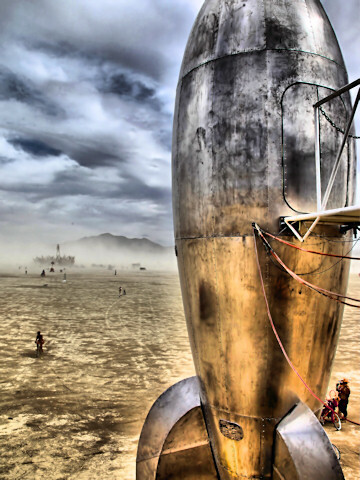 You take in the Rocket Base, a spaceport ecology where monkeys, cultures, languages, and ideas about our unnatural place in the natural order of the cosmos all meet and coalesce, budding strange new beings. 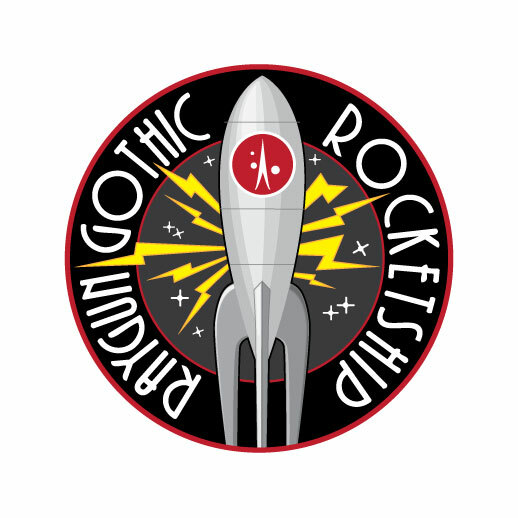 The Raygun Gothic Rocketship is a collaborative group project conceived of and designed with co-conspirators Nathaniel Taylor & David Shulman and a crew of over 60 bay Area artists and volunteers.